D.L.’s earliest inspiration was furnished by his father, who played harmonica, and an uncle who played in a Cajun band. Attending a rehearsal by the group, D.L. became enchanted by his uncle’s guitar playing. Convincing his uncle to teach him a few rudimentary chords, he took to the instrument quickly. In 1994, D.L. Menard received a National Heritage Fellowship from the National Endowment for the Arts. In 2011, D.L.’s Happy Go Lucky CD was nominated for Best Zydeco Or Cajun Music Albumat the 2010 53rd Annual Grammy Awards. Sadly, Mr. D.L. passed away July 27, 2017. He was 85. This is more like it! Pure Cajun music throughout with all songs written by Doris Leon Menard, the man with the nasal Cajun voice and the excellent rhythm guitar skills. He is accompanied by top musicians including Sonny Landreth guesting on slide guitar on two numbers. The seven remaining tracks similarly cover tales of life and death in Cajun communities and are all of high quality. “Les herbes parait plus vert” warns that the grass is not always greener on the other side while the while the closing “La vie d’un vieux garcon” tells the story of a happy bachelor. This Is followed by a short interview with D.L. 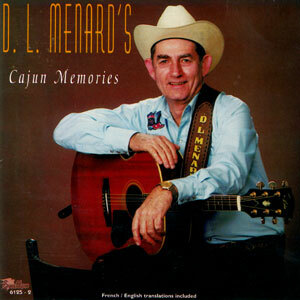 Age is no barrier for Monsieur Menard as he continues to produce uplifting and outstanding performances He has long been my favorite Cajun artist and this superb album fully justifies my choice. D.L. Menard has been a “legend in his own time” for many years now. This new release is performed by the 78-year-old “Cajun Hank Williams” with members of Terry Huval’s “Jambalaya Cajun Band.” Also joining in are Sonny Landreth (electric slide guitar), Beau Thomas (fiddle), and Al Berard (fiddle and guitar). As always he writes all of his own songs. This winner of the National Heritage Foundation Award in 1994 is a songwriter’s songwriter, who has had a lot of life to tell stories about. From the pointed tips of his cowboy boots and curved shoulders of his acoustic guitar up to that warble emanating from his throat, the great D.L. 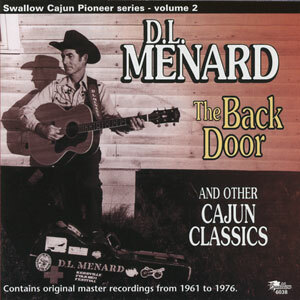 Menard owns up to every inch of his given title as the “Cajun Hank Williams.” Even simply based on 1962’s anthem, “The Back Door,” alone, his place would be cemented in Acadian legend. And in American roots history too (validated by the National Heritage Foundation Award sitting on his mantle). At 78, he’s yet to hang up that patented voice, still crooning, cawing, and crowning out nasal French like it’s those dancehall days all over. And he remains a songwriting machine, recently scrawling down these 12 tales teetering from Saturday night frolics to stone-cold mortality. The circle of homegrown musicians gravitating around him imparts a prevailing melodic grace toHappy Go Lucky, even when stoking up a honky-tonk hop. So while “The Little Cajun Musician” kicks up its heels with a slide duel between Terry Huval’s steel and Sonny Landreth’s electric guitar, “It’s the Place I’m Going to Stay” prefers a gently winding waltz. Menard even breaks out comedic shtick on “A Bachelor’s Life” finale.